The heart of any village is the village pub, and the heart of the Geese & Fountain is our bar. Whether you live locally, are staying in our B&B rooms or are just passing through the area you are welcome to join us at the bar for a drink or two. Having re-opened the pub in 2016 after it stood empty for over three years, we were delighted to be selected for inclusion in the very next CAMRA Good Beer Guide, the 2017 edition. 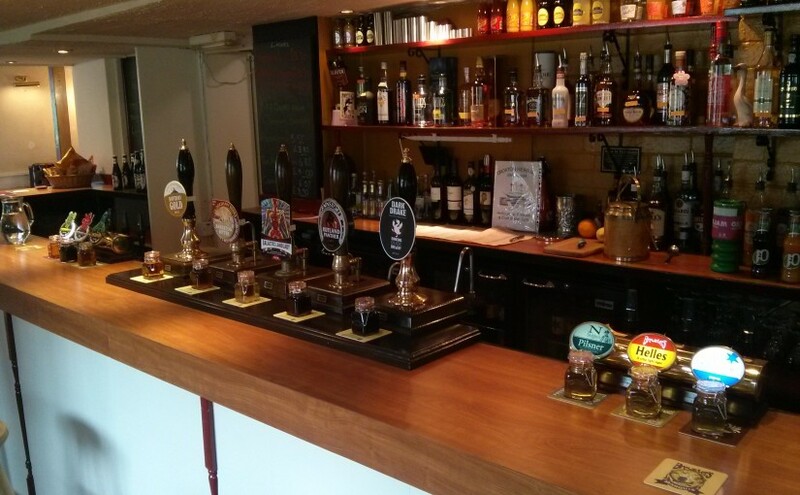 We serve only the finest in locally brewed ales, lagers and ciders. All the beers served on the bar are brewed within a 40 mile radius of the pub. Then we have an extensive selection of bottled and canned beers from some of the top breweries in the UK and abroad – from established classics like Duvel to the up-and-coming Beavertown and Tiny Rebel (brewers of the 2015 Champion Beer of Britain, Cwtch), via local brewers such as Wicked Hathern and Fynbury’s Cider from Rutland. Our wine list is sourced from organic vineyards across the world. Working with specialist wine importer Vintage Roots, we have selected wines of real flavour and character, many of which are low in added sulphur. Vintage Roots also undertakes an extensive carbon audit of the transport methods for their wine, and funds environmental projects to offset the carbon impact. Our wines are therefore ‘carbon neutral’, making them a guilt-less pleasure. As you’d expect, we also offer something a little different on our spirits shelf. Organic whiskies, gin from Loughborough, vodka from Market Harborough and even a locally distilled Absinthe are all available. We haven’t forgotten the drivers or those who simply don’t enjoy alcohol. Alongside the locally produced Belvoir Fruit Farms fruit presses, Fever Tree tonic and soda and Fentiman’s traditional soft drinks we also offer the more familiar Coke, Pepsi and J2Os. We also have a number of quality alcohol-free or low alcohol beers, including Bitburger Drive, Erdinger Alkoholfrei and BrewDog Nanny State. Download a copy of our current Drinks List – showing all our bottled and canned beers, ciders, wines, spirits and soft drinks. See a list of all the real ales we’ve ever served.